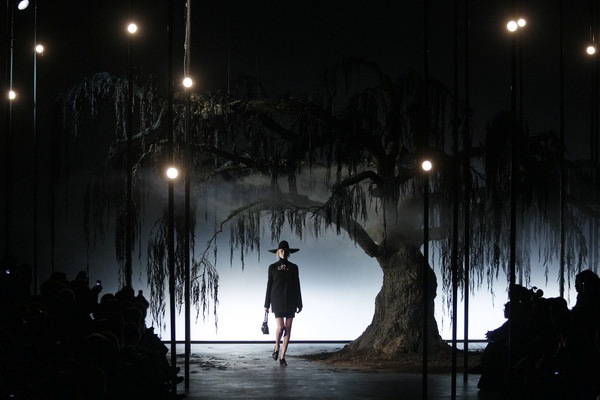 The weeping willow that dominated the stage at the Lanvin-show beautifully symbolized the roots of tradition, according to designer Alber Elbaz. And despite that serious but positive vibe, Elbaz went dark, maybe it were the hats or the soundtrack with hints of Twin Peaks. 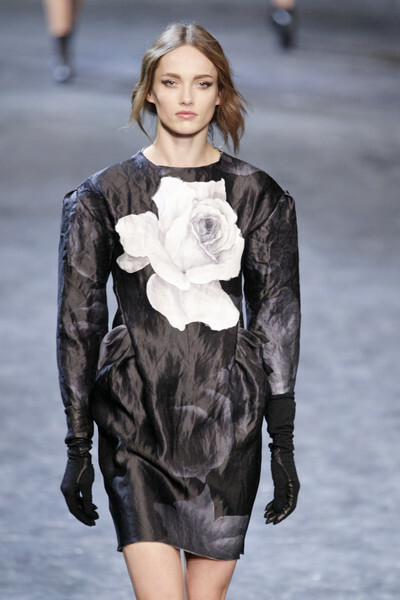 The show started with plain, grounded, coated and caped looks, with pilgrim shoes and ladylike handbags. Metal trims were a suitably, intriguing detail. But the severity had to fight itself free during the second part of the show. And the designer helped, wih metallic jewelry, textures, severe but sensual drapes, black lace, knit sheaths disordered by poufs of mousseline, and roses. It was great to witness the way Elbaz built desire into his clothes, especially with simple things like a nip and tuck of fabric or with a zipper.